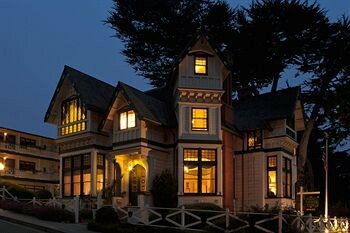 Property Location With a stay at Green Gables Inn, A Four Sisters Inn in Pacific Grove, you&apos;ll be by the ocean and minutes from St Mary&apos;s by the Sea and close to Monterey Bay Aquarium. This bed & breakfast is within close proximity of American Tin Cannery and Pacific Grove Museum of Natural History.Rooms Make yourself at home in one of the 11 individually decorated guestrooms. Complimentary wireless Internet access keeps you connected, and cable programming is available for your entertainment. Bathrooms have complimentary toiletries and hair dryers. Conveniences include complimentary newspapers and a turndown service, and housekeeping is provided daily.Rec, Spa, Premium Amenities Enjoy the recreation opportunities such as bicycles to rent or make use of other amenities including complimentary wireless Internet access.Dining Take advantage of the bed & breakfast&apos;s room service (during limited hours). Meet other guests and eat at a complimentary reception.Business, Other Amenities Featured amenities include complimentary newspapers in the lobby, dry cleaning/laundry services, and a library.